Can you confirm these amateur observations of Lankascincus fallax? Types Syntypes: ZMB 3762, NMW 16630:1-9, see Bauer et al. (2003). Diagnosis Diagnosis (genus): Compared to other lygosomine skinks, the skinks of this genus share the following combination of derived character states: size small (maximum SVL, 58 mm); nuchals undifferentiated; subocular scale row complete and non-interdigitating with supralabials; external ear opening reduced, approximately three times size of narial opening; postmental contacts first infralabial only; third pair of chin scales separated from infralabial row; outer preanals overlap inner; scales perfectly smooth; subdigital lamellae with postaxial groove basally; premaxillary teeth >11; palatal rami of pterygoids slightly expanded posteromedially; fat bodies absent; clutch size constant, two or one, depending on species (GREER 1991). Comment Type Species: Lygosoma fallax PETERS 1860 is the type species of the genus Lankascincus GREER 1991. For a general description of the species in the taxon see Taylor (1950) and Deraniyagala (1953), and for some general morphometrics see Table 1 in Greer 1991. MENDIS WICKRAMASINGHE et al. (2007) believe that Sphenomorphus rufogulus is actually the sub adult of Lankascincus fallax, and not a colour variation. The throat colour of Lankascincus fallax subadults is red. In Lankascincus fallax the throat colour is actually dark red and not black. de Silva, A. 1996. 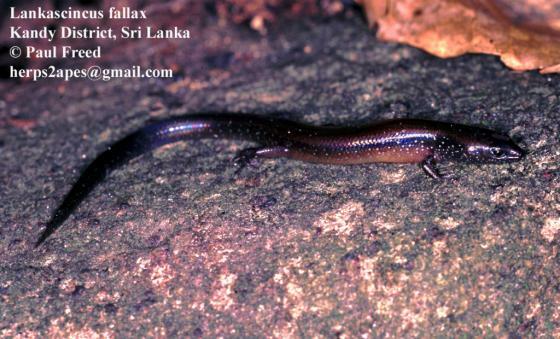 The herpetofauna of Sri Lanka: A brief review. University of Peradeniya. Privately Published, 99 pp.